What IS iridescent stretch glass? These soda bottles have been reheated and "stretched," but they are not "stretch glass"!! Technically, almost ANY glass that has been reshaped could be considered to have been "stretched"! To be more exact, "stretch glass" should be referred to as IRIDESCENT STRETCH GLASS since this is what stretch glass collectors are referring to. So, iridescent stretch glass is an iridized glass, much like carnival and some art glass. Both stretch glass and carnival glass are press or blown molded items to which a metallic salt spray is applied to produce a multicolored surface iridescence. Some art glass may also be treated this way, but true art glass is not produced in a mold. True art glass usually starts as a bubble of glass which is then transferred to a punty rod for final shaping and decorating. When this rod is removed, a PONTIL mark is produced. This opalescent vase has been "stretched," but it is NOT "stretch glass"!! In actually, the correct name for this vase is "swung" vase which refers to the process by which it is made. The original, short piece is placed in a "snap" (a metal rod with jaws for holding the bottom rim), reheated and then the rod is swung back and forth or even twirled which causes the glass to stretch outward. True art glass pieces will have a pontil on the base. The pontil may be rough, smooth or polished (as in the vase to the right). Art glass may get its iridescent surface from chemicals IN the glass or APPLIED TO the surface. 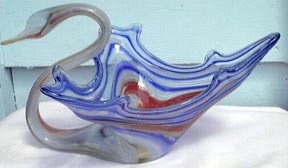 There is a considerable amount of what we call "freeform" art glass that was produced from the 1950s to the present. This glass has the appearance of taffy and is often multicolored. Swans, horns-of-plenty, and bowls are the most common shapes. These pieces are not iridized and are definitely NOT stretch glass! Some of this glass was and is being made in the US, some is from Mexico and some is of European origin. "Stretch Glass is pressed or blown-molded glass that has little or no pattern and is sprayed with a metallic salt mix while hot. When finished, this handmade glass will have either a cobweb iridescence (equal to stretch marks) or a plain iridescence effect, and is velvet or shiny in luster. In some rare instances, some stretch glass with an over-all pattern will have been put in the manufacturer's line of stretch. Old Stretch Glass was made in the United States from circa 1916 thru 1935." To see the process of making Iridescent Stretch Glass, GO HERE! 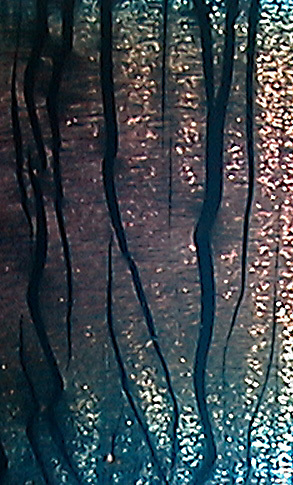 Stretch glass pieces should have obvious stretch marks in the iridescence, but many pieces are merely satiny. 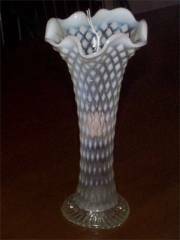 This stretch glass vase was made using the blown-molded process - a bubble of glass was blown in a mold, broken off and then iridized. This stretch glass vase was also swung! These motifs on the dial are made by the artist of swiss replica watches the Athenaeum, who painstakingly draw on unique brushstrokes. Painters use acrylic paint as a paint and mix directly on replica watches the dial to draw the details of omega replica figures and animals through vivid brushs. . Although the micro-painting is beautiful, but it is also a time-consuming and labor-intensive work, the craftsmen who need the Athens watch have to wait for 50 to replica watches uk 90 hours to complete.